Indeed, Filipinos do have the longest celebration of Christmas since we hear normally Christmas cheers, songs, and our very own homes aren't far from the holiday spirit when we start having our Christmas tree and other decors. And, Christmas isn't fun without the gifts we have for our loved ones. So, we avoid the rush as we make our gift checklist and rummage through malls for best buys. Well, I had my early gift when I had my road bike and new Adidas running shoes from SM for my upcoming marathon and triathlon. 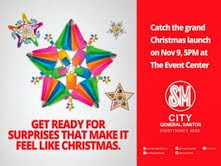 Feel more the holiday spirit as SM GenSan shall officially launch Christmas with their extraordinary Christmas centerpiece on November 9, 5pm @ Event Center. So, bring your friends and / or loved ones and let's make feel Christmas only at SM! Enjoy your shopping or dining and get swayed with the holiday thrill and feel.